An interesting talk by a distinguished scholar of Buddhism, Lewis Lancaster, who founded the Electronic Cultural Atlas Initiative to use the latest computer technology to map the spread of various strands of Buddhism from the distant past to the present. Series: "Burke Lectureship on Religion & Society". 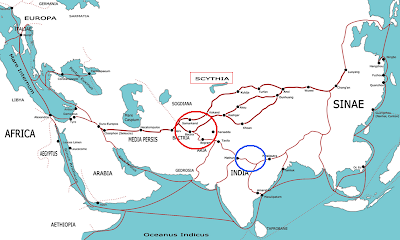 This map indicates trading routes used around the 1st century CE centered on the Silk Road. The routes remain largely valid for the period 500 BCE to 500 CE. Map source. Professor Lancaster claims in the above video that Buddhism became the first international religion, transcending language and culture, because it was so "portable." Christianity borrowed the concept of relics and monasteries from Buddhism, he claims. As can be seen in the map above (click to enlarge), Buddhism having originated in Gandhara (red circle), straddling the Silk Road, would explain the rapid rise of Buddhism along towns and cities along the Silk Road. If it had originated in North India (blue circle), off the beaten track as it were, it wouldn't have spread so rapidly.